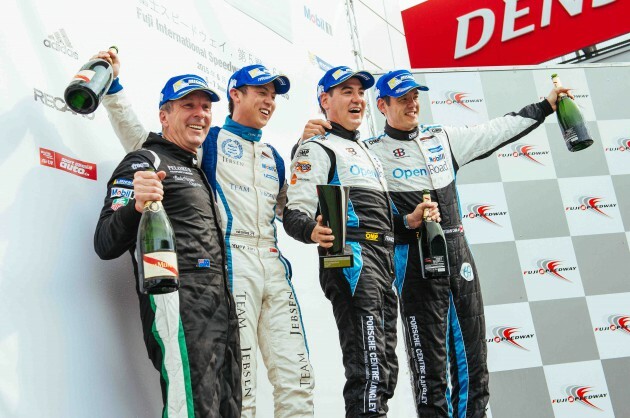 Chris van der Drift took his Kamlung Racing Porsche 911 GT3 Cup to its fourth consecutive Porsche Carrera Cup Asia victory, taking an emphatic win in Round 6 at Japan’s Fuji International Speedway to leap to the top of the overall championship leaderboard. For the second time in as many races, the New Zealander had to fend off a strong challenge from Team Porsche Holding’s Martin Ragginger of Austria, who crossed the line second ahead of Budweiser Team Absolute Racing’s Tung Ho-Pin of China. Tung stormed from his fifth place grid position to claim the final podium place, expertly finding his way through the pack and past Team Jebsen’s Rodolfo Avila. OpenRoad Racing’s Francis Tjia took the Class B win after a flawless drive to the flag, successfully keeping friendly rival Yuey Tan of Team Jebsen at bay. 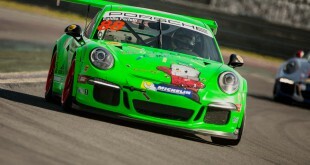 Third was Tjia’s brother and team mate, Christian Chia, taking his second career Porsche Carrera Cup Asia podium. 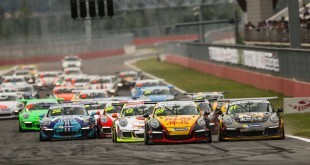 Paul Tresidder of Australia won the Porsche Carrera Cup Asia medal. In the overall standings, van der Drift leaves Japan with a nine point lead over Clearwater Racing’s Craig Baird, with Ragginger in third, thirty points adrift of the top spot, having missed two rounds. Tan tops the Class B title chase with a nine point advantage over Tjia, with Modena Motorsports’ Wayne Shen third, one point behind. As the formidable field launched off the grid, van der Drift made a superb getaway from pole and Ragginger could only follow in his wake, with Avila, Tung and Baird, seventh on the grid, three abreast into Turn 1. PICC Team StarChase driver Nico Menzel, who had lost ground at the start from his second row starting position, was immediately onto the back of Baird, the 17-year-old mounting a strong challenge to the vastly experienced Porsche expert. Menzel made a move on Lap 3, briefly getting by the New Zealand driver before Baird grabbed it back. Menzel ran wide, briefly making contact with Malaysia’s Alif Hamdan. Hamdan then came under pressure from Team Yonda’s Ro Charlz Skyangel, the battle giving Menzel the chance to close back up to Baird and resume their duel. At the front of the pack, Tung had closed up to Avila and made his move on Lap 7, immediately pulling away from the Macau driver. Lap 9 saw Menzel set up another move on Baird, this time making it stick to claim a fifth place finish. Behind, Baird and Hamdan made contact, the former spinning and rejoining behind the Malaysian. In Class B, while Tjia led the pack in the opening laps, 100 PLUS Racing Team’s Vutthikorn Inthraphuvasak was on a charge, getting by to take the category lead on Lap 5. However, the Thai driver retired with technical problems on Lap 6, and Tjia led Tan and brother Chia home. The final laps of the race saw Ragginger reel in van der Drift while having to fend off a challenge from Tung, with Avila never losing sight of the top three. However, the Kamlung Racing driver proved once again unbeatable, sailing home with a 0.788 second advantage at the end of another 15 laps of sportscar racing at its very best. 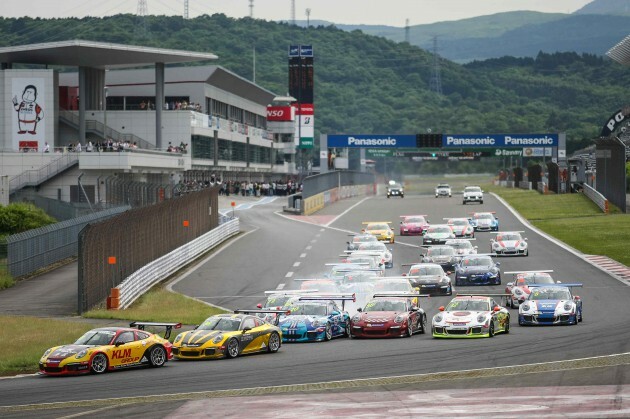 The weekend marked the second occasion the Porsche Carrera Cups of Asia and Japan have come together to produce a thrilling weekend of Porsche one-make racing, and all agreed it had exceeded everyone’s highest expectations. 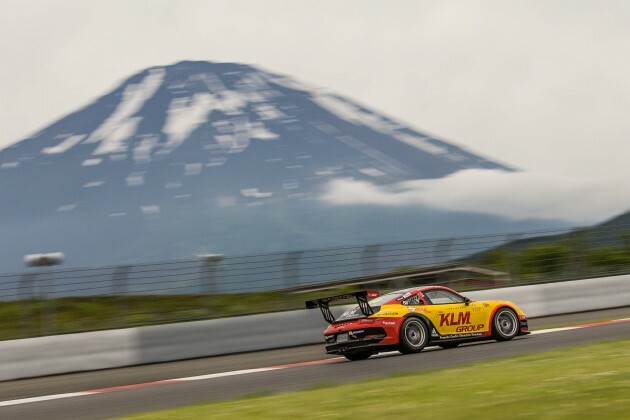 A demanding and technical track, the astonishing vistas of the majestic Mount Fuji, and an atmosphere of friendly camaraderie amongst the drivers, teams and organisers ensure that Rounds 5 and 6 of the Porsche Carrera Cup Asia is guaranteed to be a highlight of the 2015 season. The Porsche Carrera Cup Asia will be back in action in August, when the 28-strong field of Asia’s finest sports car drivers will reunite, and the battle of the overall and Class B championships will resume in earnest.